A Ryanair attempt to make fun of British Airways on Twitter after a flight mistakenly went to Edinburgh instead of Düsseldorf has backfired. 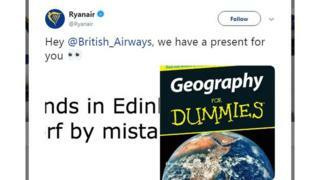 Ryanair's official Twitter account said it had a "present" for BA - a copy of Geography for Dummies. But Twitter users made a number of suggestions of books Ryanair could read, including "Customer Service for Dummies". In January Ryanair was again named the UK's least-liked short-haul airline. On Monday, a British Airways flight that was supposed to go to Germany ended up in Scotland after the wrong flight plan was used. Ryanair trolled BA in a tweet that afternoon with the suggested reading material. BA replied to the tweet saying: "No-one is perfect". But Twitter users quickly came back with book suggestions lampooning the low-cost airline, including "Employment Law for Dummies". In 2018 Ryanair was forced to cancel hundreds of flights after strike action by pilots and staff who were complaining about conditions. The strikes caused disruption for tens of thousands of passengers. In December 2018 the Civil Aviation Authority began legal action against Ryanair after it refused to pay compensation to passengers over the cancelled and delayed flights. Another commentator, Richard Spaven, referenced a story that first appeared in the Independent on 6 January about a Ryanair flight bound for Thessaloniki in Greece. The flight was diverted more than 500 miles away to Timisoara in northwest Romania. Passengers were then offered transport on an "old bus" to complete the journey, which many refused, the Independent reported. Eventually the Greek government sent an aircraft to fly the remaining passengers in. Many Twitter users poked fun at Ryanair over its practice of flying to airports that are some way from the supposed destination, for example, flying to Beauvais, which is more than 50 miles north of Paris, instead of a closer airport to the French capital. Twitter user Wayne Kavanagh asked Ryanair how much it was charging BA for the book "because you not giving it away for free", a reference to Ryanair's habit of charging customers extra, for example, to print boarding passes. In January Ryanair was named the UK's least-liked short-haul airline for the sixth year running after a survey by consumer group Which?. Passengers were not impressed by industrial action, boarding processes, seat comfort, food and drink, and cabin environment, the consumer group said. At the time, Ryanair said passenger numbers had grown 80% in the previous six years, and that reflected what people want "much more than an unrepresentative survey of just 8,000 people." British Airways declined to comment for this story.